A veneer is a small, thin layer of porcelain which is bonded to the front of a tooth to change the tooth’s shape, position and color. Veneers do not stain over time and with proper care can last a lifetime. Veneers take two dental appointments to complete. At the first visit, our doctors will prepare the teeth for the veneers and take an impression to send to the laboratory. The porcelain veneer is created in a dental laboratory based on the preparation completed by our staff. When you leave your first veneer appointment your temporary veneers will look very similar to your permanent veneers. This gives you a great opportunity to see the beautiful results before the veneers are complete. 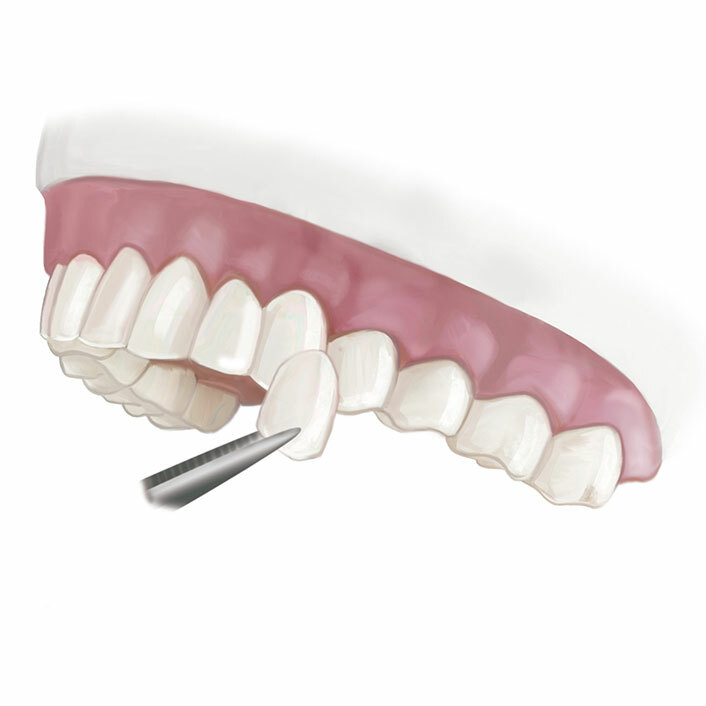 At the second appointment the veneers are bonded to your teeth. Composite veneers, sometimes referred to as bonding, is a beautiful and strong option to porcelain veneers for some patients. The biggest difference between composite veneers and porcelain veneers is that composite veneers are artistically hand-laid directly on to the tooth by the dentist. This skill does not come easily and requires hours and hours of training and practice after dental school to master. Dr. Jill and Dr. Cara feel strongly about the benefits of composite veneers and dedicated themselves to learning this craft. Dr. Jill trained with Dr. Jimmy Eubanks, one of the founders of the American Academy of Cosmetic Dentistry, and with Dr. Newton Fahl who runs an international institute on the artistry of composite. A few of the benefits to composite veneers are less tooth structure removal, less visits to the office and less anesthetic. Also, our doctors use the most recent cosmetic composite and polishing instruments to achieve a natural, personalized aesthetic finish. If you would like to see if you are a candidate for composite veneers, we would be happy to schedule a cosmetic consultation with you.